We have many projects available at a variety of price points! 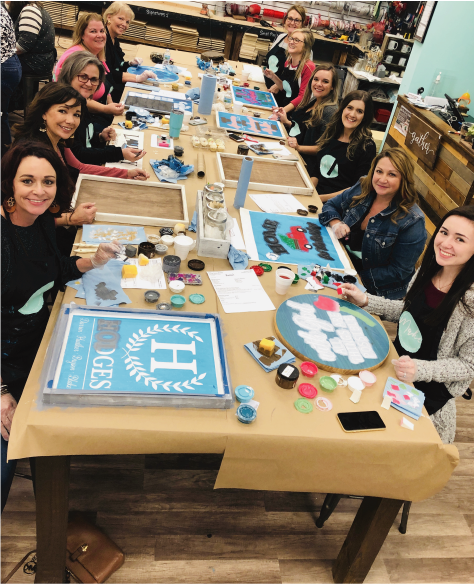 Our Open Paint Workshops have ALL of our projects available, while our Pick Your Project workshops include all projects EXCEPT Mini signs and Reversible Projects. You can view dates we are currently taking registrations for under our WORKSHOPS tab. We generally post workshops 4-6 weeks in advance. Our studio can accommodate between 30-45 painters depending on project sizes that are selected that night. Please keep in mind that our EVENING workshops are for ages 16+ only and only one guest per project is allowed in the studio. On our list of projects you'll see the TYPE of project that the design fits (Example: Signature Pallet, Statement Plank, Farmhouse Tray, etc). To register for your workshop you'll click on the desired workshop, select the PROJECT TYPE and the drop down list will appear for all designs available for that project dimension. You'll then be able to select the size of the project and additional options such as framed vs unframed. *PLEASE NOTE: Our OPEN PAINT (daytime) workshops do not REQUIRE registration. We have MOST of our standard size projects available to paint on hand. However, if you would like a personalized design, custom design or SPECIFIC design, Pre-registration is required. 4. Show up and HAVE FUN! Literally, That's it!! Our instructors will guide you every step of the way! You are welcome to BYOB into the studio! Please arrive a little early to get settled and select your paint colors! Our workshops start on time to be fair to all guests. Check out our Creativity at Home section for DIY KITS that you can complete in the comfort of your own home or purchase a few and complete them with a group of friends!